Oregon has the highest mortality rate associated with Hepatitis C or Hep C in the country and it is estimated that 95,000 Oregonians have Hep C and half don’t know it. Hepatitis C is a liver infection caused by the Hepatitis C virus. Hep C is a blood borne virus that is only passed when blood from someone who has Hep C gets into the bloodstream of another person. This is called blood-to-blood contact. 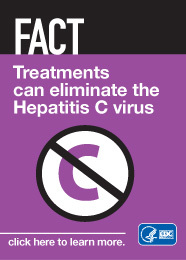 Hep C can be passed on by small amounts of blood, sometimes so small that it is not visible to the eye. Sharing any form of injection equipment such as needles, syringes, spoons, tourniquets, water, filter and preparation surfaces are common ways that Hep C can be passed from person to person. This is the most common way Hep C is transmitted in the United States. Even if someone shares injection drug equipment every now and then, only one time or maybe years ago, this is still enough risk to acquire Hep C.
Hep C can also be passed on when equipment used for tattooing or piercing is not sterile. This is more likely to occur in non-licensed facilities and non-regulated facilities. Most people with acute or chronic Hepatitis C virus infection do not have any symptoms. In general, common symptoms for chronic Hep C include chronic fatigue and depression. Many people eventually develop chronic liver disease, which can range from mild to severe, including cirrhosis (scarring of the liver) and liver cancer. Chronic liver disease in people with Hep C usually happens slowly, without any signs or symptoms, over several decades. Chronic Hep C virus infection is often not recognized until people are screened for blood donation or from an abnormal blood test found during a routine examination. If you are a person who uses injection equipment, you should use sterile injecting equipment every time and never share your equipment with another person, or use someone else’s equipment. Syringe Exchange service locations can be found through the NASEN website. Only get tattoos and piercings through licensed and qualified operators. They should use proper sterilization and equipment. Do not share personal items that may be contaminated with infectious blood, such as razors or toothbrushes. Could you be at risk of Hep C? If you have ever shared drug injecting equipment, or been involved in activities where there may have been blood to blood contact, then you might have Hep C or be at risk of getting the Hep C virus. Most people who are infected with the Hep C virus do not develop symptoms. The only way to know if you have Hep C is to get tested. If you are living with the Hep C virus, there has never been a better time to start treatment and get cured. The Oregon Health Authority has expanded treatment for Hep C to everyone on the Oregon Health Plan who’s infected, and they have eliminated the requirement that individuals with substance abuse disorder undergo addiction treatment before being treated and cured for Hep C.
There are several medications available to treat chronic Hep C. Hep C treatments have gotten much better in recent years. Current treatments usually involve just 8-12 weeks of oral therapy (pills) and cure more than 90 percent of people with few side effects (although may need to be taken longer if cirrhosis or other liver disease is present). For a complete list of currently approved FDA treatments for Hep C, click here.